Rote Kapelle 100, The Fourth District 3. This one, honestly, came down to comps. You can predict how a lot of tourney matches are going to go before the first shot is fired, and CCP Rise and CCP Dolan did a good job of that in this match. We brought an enormous number of energy neutralizers, and The Fourth District brought a lot of ships heavily dependent on capacitor to fire their guns and to use their mobility. 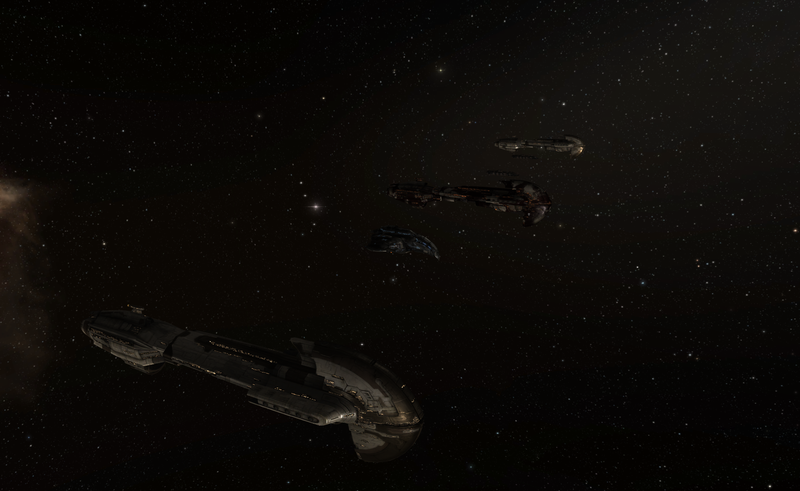 I love the Thorax, but of the most popular T1 cruisers only the Omen is a bigger cap hog. Anyway, The Fourth District flew well, I thought. We just had the "hard counter" to their comp and we used it. Good luck in the Elimination bracket! In addition to the full bracket that I posted on Friday, if you want a simplified bracket that just shows who's going to fight whom, this one's fun. The site can also do this if you click on the matches on that bracket. Our next matches are 1945 Saturday, and then either 1845 or 2000 Sunday depending on if we win or lose. Given that I had to get up at 5:30am this morning to make our match today, that makes Jester very happy. Our next one is a bit of a grudge match for us. We're fighting Verge of Collapse, who knocked us out of AT10 last year and then went on to win. In a real way, this is the match we need to win to prove that we deserve to get to finals weekend ourselves. Onward. All three commentators had moments that I thought were funny today. Yesterday, the Sicarius Draconis Bhaalgorn lost to TEST Alliance made the news for fitting a 200mm plate to a battleship. Whoops! I got some mileage out of joking that if you squint it was really a special faction warfare only 2000mm plate. Anyway, the Sicarius guys had a sense of humor about it. The pilot of the Bhaal today flew the team's Vindicator flagship, which was named "200mm plate <3" (they won). Hee, nice. Thanks to CCP Fozzie for sharing that story as well as having a funny moment when he pointed out that hosts of the Declarations of War podcast are cursed in tournaments. Ali Aras's team was knocked out today, as was Alekseyev Karrde's Noir team. Goonswarm, Dead Terrorists, and a dozen other teams are also out. Right before the Goonswarm match (versus Outbreak), CCP Rise joked "Next match is Goonswarm versus Outbreak... and I look forward to seeing Goonswarm in next year's tournament." Heh. Yup. CCP Dolan had good moments and bad moments. 32 matches per day is a lot and I joked on the CCP-CSM channel that I figured by day two the stress would start to take its toll. That proved accurate when during one tense match Dolan stood up and left Rise talking to his armpit. Heh, whoops. 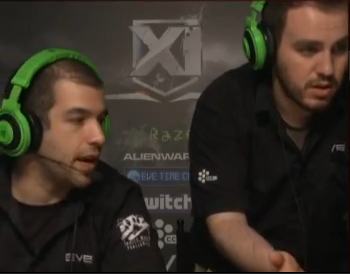 But Dolan also had a lot of funny moments, one in particular during the Pandemic Legion match. PL had entirely pulled their damage from their Dominix comp to put out another set of drones resulting in a lull in the fight. Dolan joked "Do they think EVE Online is a turn-based game of some sort?" And Dolan's commentary was generally quite good! He continues to get better every time he commentates. Speaking of Domis, Domi comps continued to be hugely popular all day. The reason behind this is the extreme versatility of the Dominix hull combined with the facts of life of the tournament setting. Tournament fights take place in a sphere 125km in radius where warp drive cannot be used. In RPG terms, it's a bit like fighting in a ten meter square room: the quarters are extremely close and this style of arena favors close range brawling comps. Other than Tengus, skirmish comps -- particularly those that operate at more than 75km ranges -- just don't work in the tournament setting. It's a bit like bringing a longbow into that ten meter room. Within that kind of radius, though, Domis can use both their amazing versatility and their huge drone bays to dominate the arena. At close ranges, they can use Gardes and heavy drones. At longer ranges, they can use Curators and a huge lock range to shoot at targets anywhere in the arena. For that reason, expect to see Dominixes be the most banned ship of the tournament when bans start to be allowed next week. Domis were so prevalent that they had their own thread on Failheap Challenge called "Dominix Team vs Anything else". Finally, there were some matches last year that were decided by bad logistics flying. The logistics role in the tournament is so important. You can't just turn it over to anyone. It's got to be someone who is both versed in flying logi and is used to the tournament format and practices just that style of flying to the exclusion of everything else. A good logi pilot is like gold. A bad one can and will lose you a match. A lot of that happened today but two less than stellar logi pilots stood out today. EVE player Woei1988 (from Drunk 'n' Disorderly), when fighting PL, didn't pre-lock his team's frigates against a Domi team and let obvious primaries get volleyed one by one. Maybe it wouldn't have made any difference but it was depressing to see him start to repair targets too late one after the next after the next. Get some practice in that, mate. DnD was pushed to the Elimination bracket. 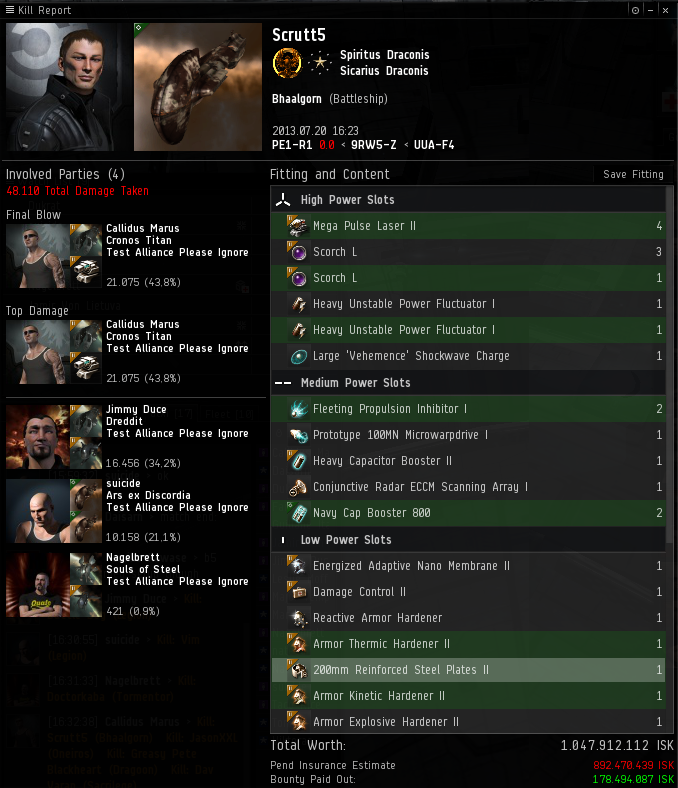 letting your own fleet-mate die when he desperately needs those reps.
Yeah, both of those really happened. There was some commentary during the match that he was trying to awox his own team. A logi pilot's job is to logi. Everything else should be taking a far back seat. D3vil's Childr3n is out of the tourney. There's one more AT-related story that happened this weekend that I want to touch on briefly, but I think I'll give it a separate post. Yep, a logi should never lock the enemy unless maybe to put ECM drones on tackle coming for you. Then hurry and unlock that target. Your reflex is to rep anything you have locked that's taking damage so if you have the enemy locked, repping it isn't too much of a stretch. important tip: if you are losing a round, start shooting the wrecks for asset denial. Jester, I was watching Rote's defense bar in today's match, and it didn't seem to change when the match began. I wondered if perhaps you had forgotten to turn on your Damnation links. If so, Rote plainly didn't end up needing them, but it still could have been an embarrassing mistake if so. Did you forget, or were the links up the entire time that we were being shown the stream, or was the Damnation not fit with links at all? I can't speak to CCP's defense bar, but I can assure you I didn't make any mistakes in how I flew the Damnation. Matter of fact, I was really pleased with how on-the-ball I was throughout the match. Looks like you weren't watching the Defense bar closely enough. It noticeably spikes about five seconds before the match starts, at about 59 seconds in the Youtube video. Is bumping not allowed in the tourney? I do not see why someone wouldn't fit a t1 battleship up with armor plates and resist gear and mwd right into one of the tinker Domis. It'd be a suicide run, but if you got some smart bombs on there and a ecm burst, you'd have some fun. It's hard as hell to bump a moving target, even a big target. It's a skill that takes a lot of practice. I suspect as much, but the Tinker Domis were moving very slow in a tight formation. Really you want to knock just one of them out of remote cap recharger range of the others and then pour on the damage. It's too bad tractor beams don't work on live drones. A Noctis or a Marauder would cause a sentry Domi all sorts of issues. In AT8/9/10, Dominixes didn't have the range or tracking bonuses that they do now. In other words, the bombers actually lived long enough to launch the bombs. Today, the drone bonuses of the Dominix are much stronger, as are its base stats. A typical tourney fit will have over 100km for both its lock range and its drone control range, and T2 Curator sentry drones will deal 600dps (with a 3k volley) out to 120km or so. In other words, the bombers will die as soon as the Dominixes can lock them -- or even faster, if the Dominixes assign drones to a frigate on their team. They'll never get a chance to launch their bombs at all.